Hemp Seed protein powder is a great source of Vegan and vegetarian protein that has a superior amino acid profile to most plant proteins, containing all 9 essential aminos, and rich in arginine and BCAAs. 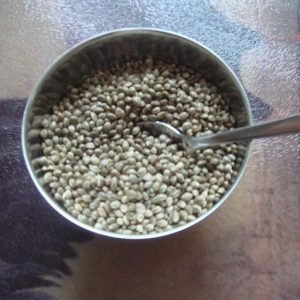 Hemp is also a good source of fiber and essential fatty acids. Hemp Seed Protein supports muscle building and recovery. Hemp Seed Protein powder is a Vegan, gluten free, lactose free and dairy free protein alternative for bodybuilding or general health. Organic Hemp Seed Protein is also available. Also see Lactose free protein powders for other products that have little to no lactose, or if you are vegetarian or vegan, see this post: Best Vegan Protein Powders. Most hemp protein is only 50% protein, the rest being fat and carbs. Because of the fat content, Hemp protein is not the first choice to take before or after workouts. The best times to take it would be between meals, and possibly before bed, as the fat will help slow digestion, allowing it to slowly feed your muscles throughout the night. ​Even if you are not looking for a vegetarian supplement, hemp seed protein powder is a great plant based protein source to mix with your whey or casein shake for a change of pace, or just to get a good mix of amino profiles in your diet. See Hemp Protein at Wikipedia. When most people think of good bodybuilding protein supplements, they think of whey protein, casein, soy and maybe egg protein. Very few people think of brown rice, pea or hemp seeds protein. Most hemp protein powders consist of approximately 50% protein. Hemp is a complete protein, made up of edestin (about 65%) and albumin (about 35%). Example Hemp Protein Powder amino acid profile. Hemp Seed Protein powder supplement is a great alternative to benefit bodybuilders that need to avoid gluten or just want to get protein from different sources.